Chrichton's World: Review Mayhem (2017): Violent but funny satire featuring Steven Yeun! 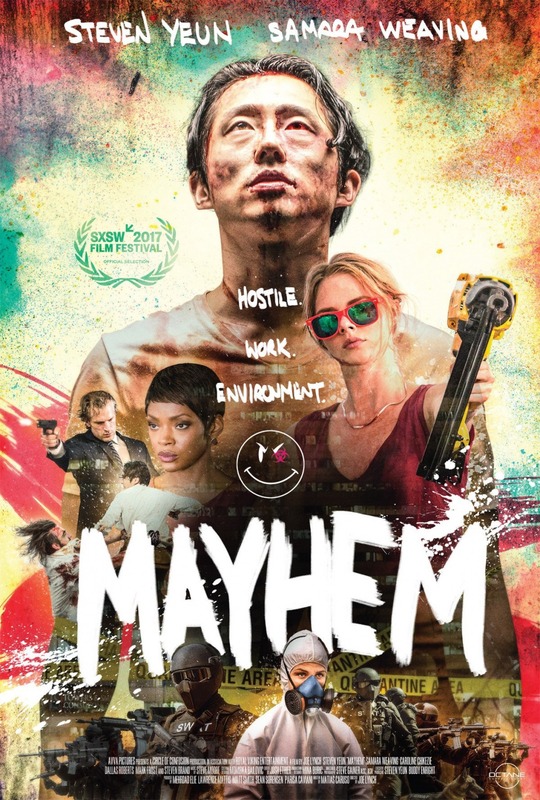 Review Mayhem (2017): Violent but funny satire featuring Steven Yeun! A lot of fans of Steven Yeun who played Glenn in The Walking Dead probably are wondering what he is doing now. Well, seems like Steven Yuen is doing quite well with Mayhem, one of the bigger projects he is involved in. He plays Derek Cho who has the worst day of his life when he gets stuck in an office building that has been infected with a virus that makes people act out their wildest impulses. How will he get out of this dire situation? Mayhem is more a black comedy than horror although it is quite bloody, gory and quite terrifying but not in the way you would expect. The terrifying part comes from the fact that apart from some fantastic elements a lot of the events and the corporate mentality is realistic enough. The way higher ups treat their workers and clients just to make a quick buck and keep making them even if that means they screw over innocent people. But there is a glimmer of hope in all this darkness and that is Derek Cho who is on the verge to battle these higher ups with whatever he can. There is a reason why he managed to rise among the ranks as quickly as he did. He is intelligent, clever and unlike his bosses does have integrity. Steven Yeun is very likeable as Derek Cho even if his soul is a little tainted by corporate greed. He himself might think he lost his way but he is not downright evil. Yeun shows these two sides to him effortlessly and is exactly the reason why you root for him all the way. But he is not alone in this. The rest of the cast do a good job of making this world believable. What is most fun about this film that it doesn't exactly play out you think it does. The title is therefore a little misleading. Don't worry, the mayhem is present but let's say that it's a means to an end and not the focus. Mayhem is incredibly fast paced and quite the ride that will have you fully immersed. Since it does rely on plot a lot I can't and won't reveal any elements of this plot since not knowing anything makes the viewing experience considerably better. Mayhem is a real blast from start to end and it's very weird that I had not heard about this film at all. It definitely deserves and audience. So do yourself a favour and go watch it!